Finally, after a long time waiting, those of us who decided to forgoe the Call of Duty Elite bundle can now get their hands on this highly sought after DLC for Modern Warfare 3. For all of us who chose to not subscribe to Elite, we finally have our time to join in the fun with the “Content Collection 1” pack appearing on the Sony PlayStation 3. 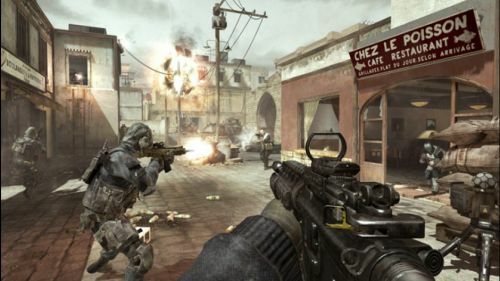 After waiting patiently for a crack at the new maps, players on other consoles (namely Xbox 360) were given the chance to play them since January. Armed with just this one content pack, players can choose between heading to a militarized Central Park in Liberation, destroying scenic vistas in a seaside Italian getaway in Piazza, raining glass on New York passerby from 70-stories-up in Overwatch, and battling beside a downed Air Force One in Black Box. As if that breadth of multiplayer variety wasn’t enough, fans of Special Ops can hop aboard snowmobiles to infiltrate a diamond mine in ‘Black Ice’ or head to India, where ‘Negotiator’ will leave the fate of the hostages in their hands. Well, that’s about it! There isn’t much else to say other than go download it and get your multiplayer on! The DLC costs a mere $14.99, which isn’t nearly as bad as how long you’ve all waited to play the maps. As an added incentive, tomorrow starts another Double XP Weekend, giving you a great opportunity to level up and play with some new variety.